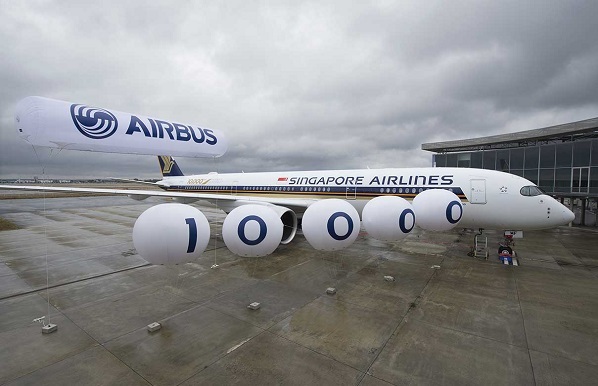 Airbus today celebrated the delivery of its 10,000th aircraft - an A350-900 for Singapore Airlines. The milestone event was marked by a special ceremony in Toulouse hosted by Airbus Group chief executive Tom Enders and attended by Goh Choon Phong, chief executive of Singapore Airlines. The aircraft delivered today is the sixth A350-900 for Singapore Airlines, out of a total order for 67. Featuring a special “10,000th Airbus” logo, the aircraft will be used to launch the airline’s new non-stop services between Singapore and San Francisco later this month. The 10,000th Airbus delivery comes as the manufacturer achieves its highest level of production ever and is on track to deliver at least 650 aircraft this year from its extensive product line. These range from 100 to over 600 seats and efficiently meet every airline requirement, from high frequency short haul operations to the world’s longest intercontinental flights. “Since our earliest days innovation has been at the heart of everything we do at Airbus,” said Enders. “This has seen us develop what is today the world’s most modern and comprehensive aircraft family. Singapore Airlines placed its first order with Airbus in 1979 and over the years the carrier and its subsidiaries have ordered every successive model produced by the manufacturer. Today the mainline carrier operates the A330, A350 XWB and A380, while its regional subsidiaries Silkair and Tigerair fly aircraft from the single aisle A320 Family. Airbus delivered its first aircraft, an A300B2, to Air France on May 1974. Initially working exclusively in the widebody sector with the A300 and A310, the manufacturer moved into the single aisle market in the mid-1980s with the launch of the best-selling A320. Setting new standards in aircraft design, technologies introduced on the A320 were subsequently incorporated on the A330 and A340 in the early 1990s, marking the first time that single aisle and widebody aircraft benefitted from similar operational characteristics.